We started out with a sensory activity. I squeezed some different colored paints ( blue, purple, black, light blue, glitter paint) onto a piece of construction paper. 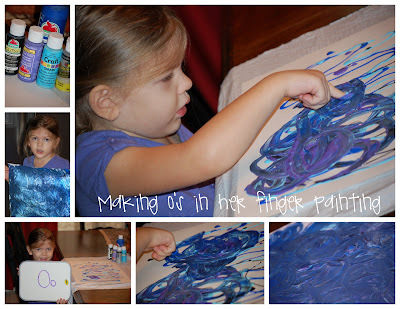 Kaitlyn practiced making her o's by moving the paint around with her finger. When she was all done we sprinkled on some glitter and set it outside to dry. 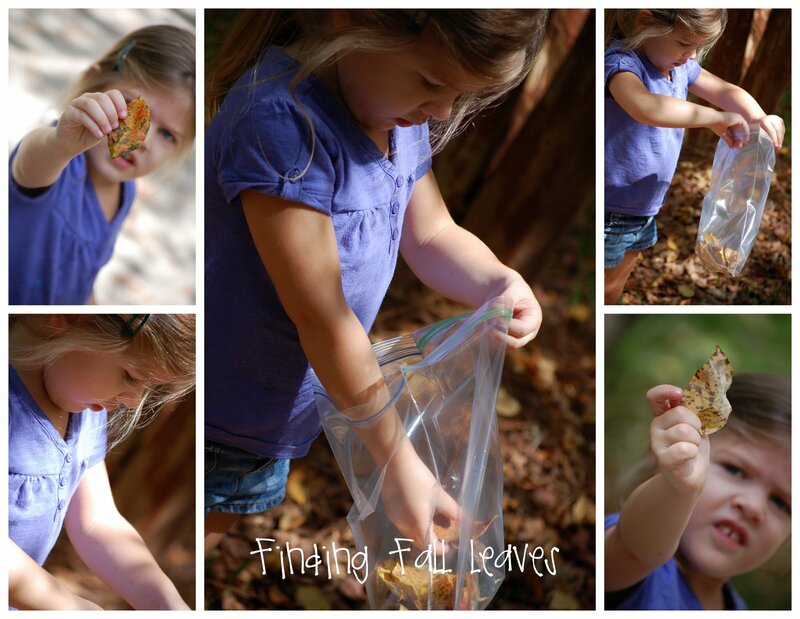 While it was drying we went out to the front yard and gathered some fall leaves and found a nice branch for our picture. 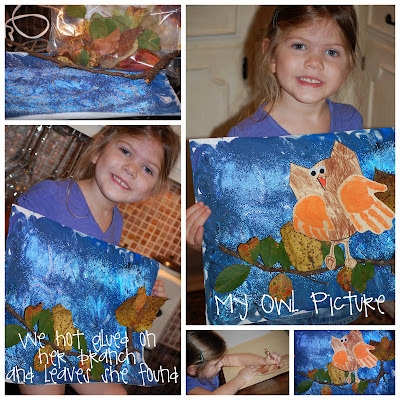 I used the hot glue gun to attache her branch and her leaves onto her painting. 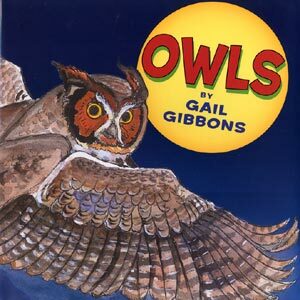 I then traced the body of an owl onto some construction paper and asked Kaitlyn to color him brown.....I look over a few seconds later and see that she drew feet onto the owl ( this was a first for Kaitlyn) She is starting to become more accurate in her depictions of things. 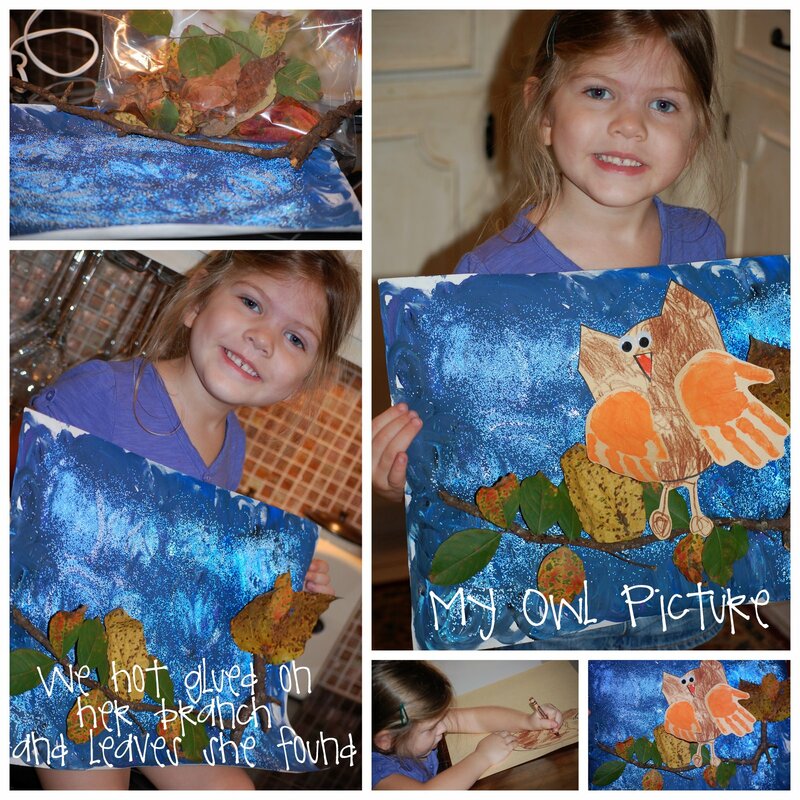 We made some handprints for wings and added them onto her picture! Kaitlyn and I had some fun in the kitchen this afternoon cooking up some orange cupcakes. Kaitlyn and I decorated them to look like owls. We used oreos and little green candies for the eyes. 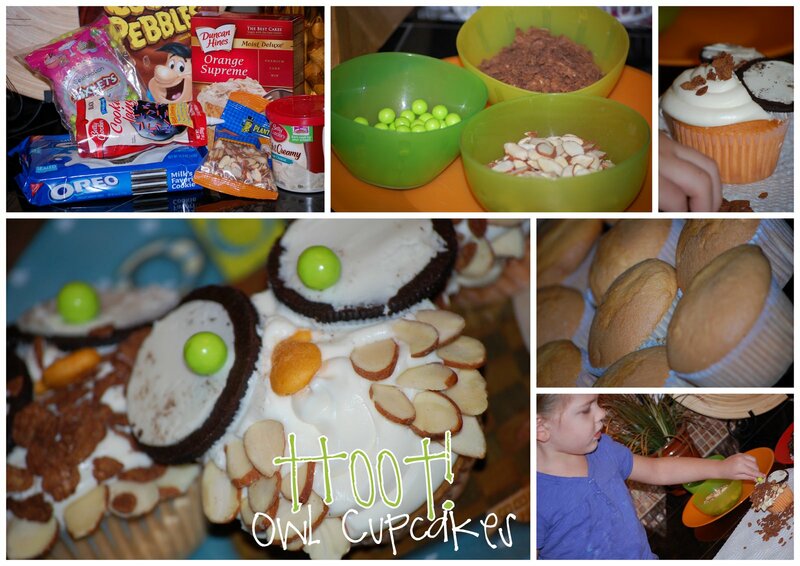 She then decorated the bodies with almond slivers and cocoa pebbles cereal to mimic the feathers. The finishing touch was a goldfish cracker as a beak. They were so much fun to make! Now to find a small army to eat some owl cupcakes! Kaitlyn loves "school" time and loves practicing with her learning puzzles. This is a great one that we actually got as a gift. Kaitlyn matches the color or texture to the object. 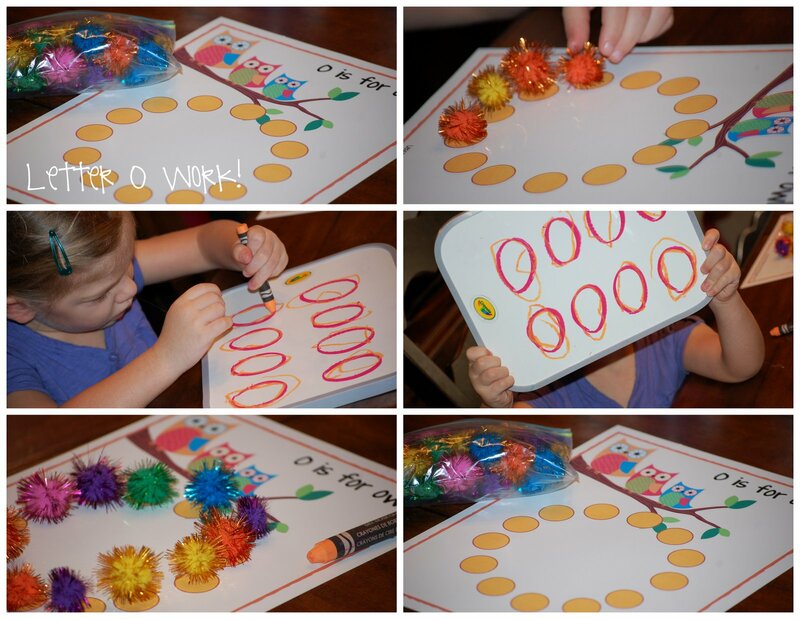 It is a great way to learn about describing words. 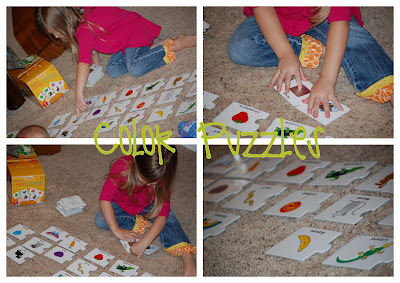 When she is all done she practices reading the cards by pointing to the words and saying the describing word and the objects name.....a great way to develop those early reading and decoding skills. Those owl cupcakes are so cute!! I've seen using oreos for eyes, but almond slices for feathers is a great idea!